Earlier this month, the United States marked the 50th anniversary of the Selma voting rights marches. While much has changed since, racial wealth gaps have persisted over the past 30 years and even grown since the Great Recession. Today the richest 10 percent of white families own 65.1 percent of the nation’s wealth. In a new report (PDF), Brandeis University’s Institute for Assets and Social Policy (IASP) and Demos, a progressive think tank where I work as a researcher, investigate what it would take to close this gap. The report concludes that racial disparities in wealth are driven by public policy decisions and calls for “racially aware policies” that could help reduce America’s rising wealth inequality. This includes eliminating disparities in homeownership rates, college graduation and the return on a college degree as well as the wealth return on income. Conservatives and centrist commentators often present college education as a near panacea to reduce the racial wealth gap. But the Demos/IASP report challenges this claim. It found that increasing graduation rates would reduce the wealth disparity between black and white people by only 1 percent and between Latinos and whites by 3 percent. There are many possible reasons for this. For one, students of color take out more in student loans than white students. The debt burden detracts from wealth-building opportunities over a graduate’s lifetime. In addition, people of color are less likely to get into the most selective schools and face discrimination in labor markets after graduation. As a result, black and Latino students do not reap the same gains from a college education as their white counterparts. In fact, race is a far greater determiner of wealth than education. As Demos blogger Matt Bruenig pointed out last year, black college graduates have less wealth than white high school dropouts. Using a new model called the racial wealth audit, Demos/IASP researchers found that the racial wealth gap between white and black families would be reduced 10 percent if the returns on college education could be equalized. But that’s not nearly enough to close the divide. Bruenig’s previous research found that blacks and Latinos in the same income brackets have less wealth than whites. The Demos/IASP report confirms these findings: Black and Latino households with similar income distribution as whites would still face a substantial wealth gap. Eliminating income gaps would reduce the wealth gap by only 11 percent for black people and 9 percent for Latinos. Among black households, the average family would own $92,545 less wealth than an average white family. The average Latino family would own $94,033 less wealth than the average white family. This is because income distribution only tells part of the story. The remaining gap can be explained, in part, by the differences in opportunities to turn wages and salaries into wealth. Controlling for the differential returns on every dollar of income shows a far greater effect on wealth disparity. In fact, for every $1 that accrues to black families with an increase in income, white families earn $4.06. For every $1 in wealth for additional income to Latinos, white families earn $5.37. The racial wealth audit shows that equalizing the return on income could reduce the wealth gap with white households by 43 percent for black households and by 50 percent for Latino households. But black and Latino families earning the same incomes as white families will still have only half the wealth. It may be surprising to those who think that racial equity depends on equal opportunities in the labor market alone. But it’s important to remember that income is a flow, while wealth is a stock. White families have been building up wealth for centuries, thanks in part to the enslavement of black people and discrimination against blacks and Latinos, who were excluded from those gains. A 2004 paper from economists Maury Gittleman and Edward Wolff provides some hint as to why income equity cannot solve the racial wealth gap. After controlling for income and with a similar return on capital, the authors found that black families save at the same rate as whites. Previous IASP research corroborates their findings (PDF). Differences in wealth outcomes are explained by factors such as inheritance, home ownership and unemployment. As shown in the chart above, in another study (PDF), Wolff and Gittleman demonstrate that black and Latino families are far less likely to receive wealth transfers and that when they do, they tend to be smaller. Wealth transfers include inheritances and tax reductions, which disproportionately benefit white people. In fact, wealth transfers are the most unequal aspect of the wealth disparity. The Gini coefficient, the most common measure of inequality, runs from 0 (in which all wealth transfers are equal) to 1 (in which one household receives all wealth transfers). In 2007 the Gini of wealth transfers (primarily inheritances) was 0.961, compared with a 0.489 posttax and transfer Gini of income in the same year (PDF). That is, the distribution of wealth transfers is twice as unequal as the distribution of income. Even when households that did not receive a wealth transfer are excluded from the analysis, the Gini is still at 0.814. That means nearly all the wealth transfers in the U.S. go to a small group of people at the top. Groups that seem to persist in low or high status, such as the black and the Jewish populations in the United States, are not exceptions to a general rule of higher intergenerational mobility. They are experiencing the same universal rates of slow intergenerational mobility as the rest of the population. Their visibility, combined with a mistaken impression of rapid social mobility in the majority population, makes them seem like an exception to a rule. They are instead the exemplary of the rule of low rates of social mobility. Clark found that the residual effects of family wealth remain for 10 to 15 generations. A family’s wealth cache simply won’t go away without dramatic changes. Even more concerning, the notion that racial inequality can take care of itself is not only embraced by white millennials but also by millennials of color (though to a lesser extent). This means that the institutionalized structural barriers to racial equity are not receiving enough attention. Many Americans fail to understand how much more unequally wealth and financial assets are distributed than income. To parrot Roberts, the best way to reduce the racial wealth gap is to reduce the racial wealth gap — not simply to increase access to education or income. Policies that bolster home ownership — the leading wealth asset for most middle-class families — and those that reduce neighborhood segregation will do far more to close the wealth gap than changes in education. Other progressive ideas such as a baby bond program, which establishes wealth-building opportunities for those who have been excluded from them in the past, could substantially reduce wealth gaps. Deeply entrenched wealth disparity is the product of history. Eliminating it entails reckoning with history as well as robust public policy reform. Ideological commitments to equality of opportunity without policy action won’t be enough. This entry was posted in Economics, Politics, Race and tagged homeownership, inequality, race, racial wealth gap, upward mobility on May 27, 2015 by seanadrianmc@gmail.com. Blinder and Watson attribute half these benefits to productivity shocks, consumer expectations and favorable economic conditions. They leave the other half unexplained, but studies suggest that liberal policies increase growth by boosting wages and perceptions about income security. By contrast, Republican policies slow growthand immiserate the population. The researchers also found that the economy grew even faster when Democrats control both chambers of Congress and the presidency. All in all, those who claim that Democrats have abandoned the middle class or failed blacks are missing a larger story. While the Democratic Party has been imperfect in responding to the policy demands and preferences ofblacks and low-income voters, it has done a far better job of improving their condition than Republicans have. Conservatives’ attempts to rebrand themselves as beneficial to the working class or people of color will succeed only if voters remain unaware of their actual record. This entry was posted in Economics, Politics, Race and tagged Democrats, incarceration, income, inequality, redistribution, Republicans, upward mobility on May 24, 2015 by seanadrianmc@gmail.com. When discussing race, the conservative argument is best expressed by the famous words of Chief Justice John Roberts: “The best way to stop discrimination on the basis of race is to stop discriminating on the basis of race.” Translation: America has done bad things in its history, but those bad things are gone now, so we should move past those horrors and look forward. Conservatives believe that if blacks and Latinos simply work hard, get a good education and earn a good income, historical racial wealth gaps will disappear. The problem is that this sentiment ignores the ways that race continues to affect Americans today. A new report from Demos and Brandeis University, “The Racial Wealth Gap: Why Policy Matters,” makes this point strongly. The report shows that focusing on education alone will do little to reduce racial wealth gaps for households at the median, and that the Supreme Court, through upcoming decisions, could soon make the wealth gap explode. Wealth is the whole of an individual’s accumulated assets, not the amount of money they make each year. As such, in his recent book, “The Son Also Rises,” Gregory Clark finds that the residual benefits of wealth remain for 10 to 15 generations. To understand why that matters, consider the fact that Loretta Lynch, Obama’s recent nomination for U.S. attorney general, is the great-great-granddaughter of a slave who escaped to freedom. (That’s four generations). Consider also that most people on Social Security today went to segregated schools. (That’s two generations.) If Clark is correct in his thesis, then the impacts of wealth built on the foundations of American slavery and segregation will continue to affect Lynch’s great-great-great grandchildren. It is therefore unsurprising that addressing just one aspect of this disparity cannot solve racial wealth gaps. Demos/Brandeis find that equalizing graduation rates would reduce the wealth gap between blacks and whites by 1 percent, and between Latinos and whites by 3 percent at the median. Equalizing the distribution of income would only reduce the wealth gap by 11 percent for blacks and 9 percent for Latinos. Part of the durability of wealth gaps is the disproportionate benefits that whites still enjoy: They face less job market discrimination and are more likely to reap a big inheritance, for example. This means that the returns to education and income are generally higher for whites. But even after controlling for these returns, income and education can’t explain the entire wealth gap. Because America’s primary vehicle for wealth accumulation is our homes, much of the explanation of the racial wealth gap lies in unequal homeownership rates. According to the Brandeis/Demos analysis, equalizing homeownership would reduce the racial wealth gap by 31 percent for blacks and 28 percent for Latinos. This effect is muted because centuries of discrimination—including racial exclusion from neighborhoods where home values appreciate, redlining, and discriminatory lending practices—mean that people of color are segregated into relatively poor neighborhoods. Indeed, in 1969, civil rights activist John Lewis bought a three-bedroom house for $35,000 in Venetian Hills, Atlanta. He and his wife were the first black family in the middle-class neighborhood. In his book, “Walking with the Wind,” he notes that, “within two years… the white owners began moving out.” Had the value of his house simply kept up with inflation, it would be worth $222,881 today. But Zillow shows that three-bedroom houses in Venetian Hills, Atlanta, are currently selling for around $65,000 to $100,000. Systematic disinvestment in communities of color means that even when blacks and Latinos own their homes, they are worth far less than white homes. In addition, blacks and Latinos are targets of shady lending. They are more likely to be offered a subprime loan even if they are qualified to receive a better rate. In the wake of the financial crisis, big banks like Blackstone scooped up foreclosed homes and are now offering them to people of color to rent, further pulling wealth out of these communities to benefit rich whites. These problems are troubling, but, as unlikely as it seems, things are about to get even worse. The Supreme Court is set to decide Texas Department of Housing and Community Affairs v. The Inclusive Communities Project, a landmark case challenging the disparate impact test, which allows a practice to be considered discriminatory if it disproportionately and negatively impacts communities of color, even if a discriminatory intent can’t be proven. The case involves an excellent example of why disparate impact is so important: Nearly all of the tax credits that the Texas Department of Housing and Community Affairs had approved were in predominantly non-white neighborhoods. At the same time, the department disproportionately denied the claims in white neighborhoods. A federal judgedecided that regardless of racial intent, the result had a “disparate impact” and increased neighborhood segregation. As Nikole Hannah-Jones has extensively documented, disparate impact has been crucial in holding banks accountable. For instance, the Justice Department used it to settle with Bank of America for $335 million after it was discovered that a mortgage company purchased by BofA had been pushing blacks and Latinos into subprime loans when a similar white borrower would have qualified for a prime loan.Because there was no official policy that required blacks and Latinos to get worse loans, the case would not have been won but for the disparate-impact statute. Demos and Brandeis suggest policies to boost homeownership, like better enforcement of anti-discrimination laws, lowering the cap on the mortgage interest deduction so blacks and Latinos can benefit and authorizing Fannie Mae and Freddie Mac to allow homeowners to modify their loans. In addition, America needs to systematically invest in poor neighborhoods. Equalizing public school education funds for poor and nonwhite schools would increase home prices in poor neighborhoods. In addition, a baby bond program would directly reduce wealth gaps by giving children money that could be used for a down payment on a house or an investment in their education. What’s clear is that we cannot simply hope that wealth gaps will disappear. These gaps were created by racially biased federal policies and need to be remedied by public policy as well. Government created the white middle class in the 1950s; now it’s time to create a black and Latino middle class. The Supreme Court, with its supposedly race-neutral philosophy, will only make it more difficult to close racial wealth gaps. This entry was posted in Economics, Politics, Race and tagged education, homeownership, inequality, race gap, racism, Supreme Court, upward mobility on April 29, 2015 by seanadrianmc@gmail.com. Why is Cuomo Leaving Wall Street Cash on the Table? Governor Andrew Cuomo has claimed that he’s “a progressive Democrat who’s broke.” But in his most recent executive budget, he proposes ending a little-known tax that could make all the difference. For the last century, New York State has had a stock-transfer tax, which taxes nearly every stock trade. Since 1981, it’s been instantly rebated—no money is actually collected—leaving potential revenue on the table even as financial profits skyrocket. Cuomo suggests ending the tax, citing “unnecessary administrative work.” But New York’s stock-transfer tax can be easily re-implemented, instead putting that administrative work to good use. Cuomo should work to end or reduce the tax rebate, rather than take the tax off the books. New York isn’t broke so much as unequal: one in every twenty-two people in New York City is a millionaire, while 56,987 New Yorkers live in homeless shelters. A tax like this could raise hundreds of millions of dollars. The financial sector grew as a share of the economy by 175 percent from 1947 to 2013. This rapid growth has led many to observe that the financial sector increasingly relies on rent-seeking: making money from moving money around only to make more money. Financiers no longer need bother with productive investments. Wall Street is flush with cash, but the state’s coffers continue to struggle. Public employment in New York dropped by 4.2 percent between December 2007 and June 2014. A modest 0.02 percent tax on stock transactions would raise hundreds of millions of dollars annually. New York City faces incredible risks from climate change. A recent report estimates that, without adaptation, the annual costs of climate change will be between $3.8 billion and $7.5 billion per year at mid-century. The stock-transfer tax could provide, on its own, a major head start toward protecting New York City from devastation. Opponents of a tax on stock transactions claim that it would reduce trading and jobs and harm the economy, and it would certainly slow down short-term, highly speculative trading to some extent. The real question is: What are the costs that New Yorkers face right now from runaway speculation and insufficient public investment? Our research finds that New York would gain more from the revenue raised, which could be funneled toward job creation, even though falling trade may cause some job loss in the financial sector. Of course, some of those astronomical profits that Wall Street banks keep reporting could be put toward the tax as well. Finance has increased inequality, pulled money out of the job-creating economy and largely sustained itself on grift. To reduce these negative effects, we should tax financial transactions as well. In the wake of the recent financial crisis, a tax could be a way to reduce systemic risk. Although the New York stock-transfer tax would cover only stock trades, it could provide a model for a more comprehensive national tax on a broader range of financial transactions, like derivatives. Such a tax isn’t unprecedented. After all, New York had one in place from 1905 to 1981. From 1914 to 1966, the United States levied a modest tax on sales and transfers of stock. House Speaker Jim Wright pushed for a renewed federal tax in 1987, proposing a fee of 0.25 to 0.50 percent on the buyer and seller in each securities transaction, highlighting the tax’s progressive aspects. More recently, Senator Tom Harkin and Representative Peter DeFazio proposed the Wall Street Trading and Speculators Tax Act, which would assess a tax of 0.03 percent on trades of stocks, bonds, futures, options, swaps and credit-default swaps and would generate some $350 billion over nine years. Representative Keith Ellison proposed the Inclusive Prosperity Act, which would entail a 0.5 percent tax on stocks, a 0.1 percent tax on bond trades and 0.005 percent tax on derivatives; that bill was projected to raise similar amounts. On May 6, 2014, ten European nations issued a joint statement that a financial tax would commence in 2016 as a means to reduce speculation and raise revenue. The initial tax will focus on the trading of stocks and some derivatives. The European Commission estimates that a broad tax could raise 31 billion euros ($39 billion) in annual revenue. In New York, revenue is desperately needed. Governor Cuomo should support Assemblyman Phil Steck’s bill, which would begin collection for 40 percent of the tax and was supported by economist Jeffrey Sachs. Sachs has said that the “financial transactions tax is a solid idea that has been resisted by Wall Street for years.” Instead of repealing the tax, New York should restart collection and use the revenues to stimulate equitable economic growth. This article originally appeared in the print version of The Nation and online. This entry was posted in Uncategorized and tagged Andrew Cuomo, finance, financial transaction tax, inequality, infrastructure, jobs, STT, upward mobility, Wall Street on December 21, 2014 by seanadrianmc@gmail.com. Recent events in Ferguson, Missouri, have once again made the nation consider the durability of racial injustice as a defining factor of the American experience. Black children go to increasingly segregated schools, experience significantly less mobility than whites and are far more likely to be incarcerated for nonviolent crimes. The American dream has always been defined by upward mobility, but for black Americans, it’s harder to get into the middle class, and a middle-class lifestyle is more precarious. There are numerous factors that help explain why blacks have lower levels of upward mobility, but a surprisingly unpersuasive one is family structure. Conservatives like to tout the research of Raj Chetty and others who find that, “The fraction of children living in single-parent households is the single strongest correlate of upward income mobility among all the variables we explored.” But this observation comes with a caveat — children in two-parent households fare worse in areas with large numbers of single parents. There is reason to believe the causation is reversed. Rather than single-parent households causing low upward mobility, low upward mobility and rampant poverty lead to single-parenthood. 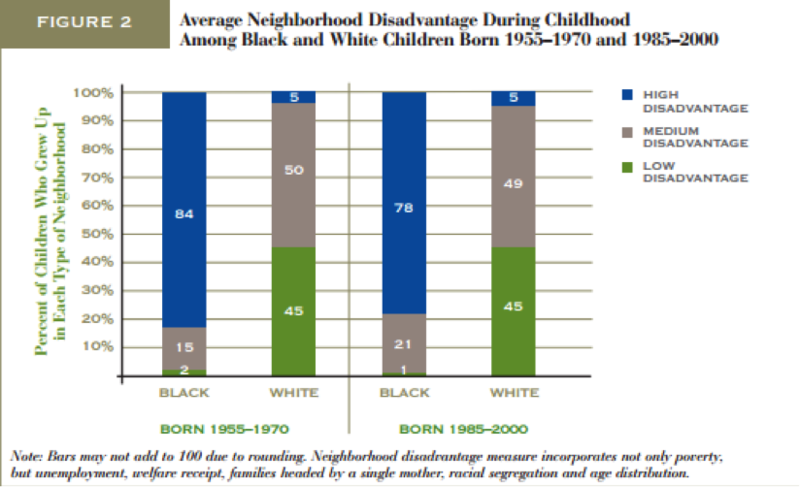 Most recently, Bhashkar Mazumder finds that, among those between the late 1950s and early 1980s, 50 percent of black children born into the bottom 20 percent of the income scale remained in the same position, while only 26 percent of white children born into the bottom 20 percent of the income scale remained in the same position. His research finds that the role of two-parent families for mobility is less important than conservatives assert. While living in a two-parent households increases upward mobility for blacks, it has no effect on upward mobility for white children, nor does it affect downward mobility for either race. If marriage has a significant effect, it is not marriage per se, but rather income and parenting effects that are at work; married people by default have more incomes and more time to spend with children. The solution, then, is paid leave, universal pre-K and government-provided daycare, not wealthy conservatives clutching their pearls and chastising young people for not getting hitched. So, marriage fails to explain black-white gaps in mobility. What, then, is responsible for the lack of upward mobility among blacks? Racial segregation explains how it’s so easy for the black middle class to slip back into poverty. As sociologist John R. Logan writes, “The most recent census data show that on average, black and Hispanic households live in neighborhoods with more than one and a half times the poverty rate of neighborhoods where the average non-Hispanic white lives.” This has profound implications for upward mobility. The war on drugs disproportionately targets people of color: One in 12 working-age African-American men are incarcerated. While whites and blacks use and sell drugs at similar rates, African-Americans comprise 74 percent of those imprisoned for drug possession. The U.S. prison population grew by 700 percent between 1970 and 2005, while the general population grew only 44 percent. The effects of incarceration on upward mobility are profound. Bruce Western finds that, “by age 48, the typical former inmate will have earned $179,000 less than if he had never been incarcerated.” This impact, however, is more profound for blacks. Western finds that incarceration reduces lifetime earnings for whites by 2 percent, but Hispanics and blacks by 6 percent and 9 percent, respectively. All of this means that men who are incarcerated will live a life at the bottom. For men who begin life in the lowest income quintile, only 2 percent of those who are incarcerated will make it into the top fifth, while 15 percent of those who are not incarcerated will. In “When Work Disappears,” Harvard sociologist William Julius Wilson points to the importance of occupational segregation — the fact that African-Americans who are often concentrated in poor urban areas struggle to get jobs in the suburbs or places with a long commute. Only 2.9 percent of white workers rely on public transportation, compared to 8.3 percent of Latino workers and 11.5 percent percent of black workers. Much of the problem is social networks. Recent research by Nancy DiTomaso finds that favoritism perpetuates inequality, even in the absence of racial bias. She finds that most employees relied on social networks to obtain a majority of the jobs they held in their lifetime. 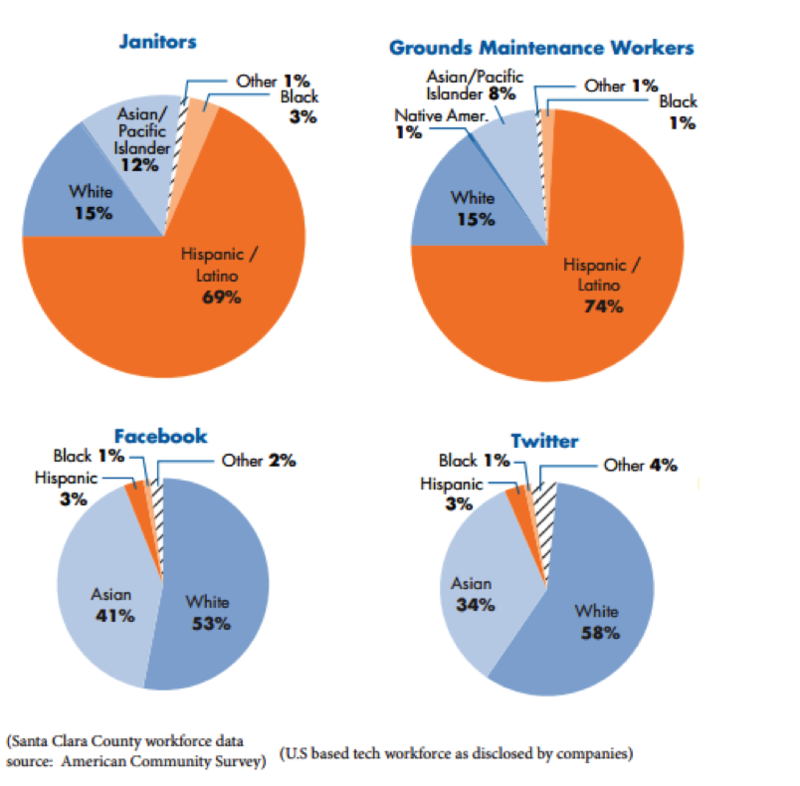 Because social networks tend to be segregated, this fosters occupational segregation. Miles Corak shows that many children get their first job through their parents, further solidifying the effect of social networks on occupational segregation. Marianne Bertrand finds that changing the names on résumés to those that are traditionally white or black affects call-backs for jobs. White-sounding names were 50 percent more likely to get called for an initial interview. She also finds that whites with better résumés were 30 percent more likely to get a call-back than whites with worse résumés, but for blacks, more experience only increased call-backs by 9 percent. Another barrier to employment can be social networks. Schools today are becoming more segregated, rather than less segregated. The average white student attends a school that is 72.5 percent white and 8.3 percent black, while the average black student attends a school that is only 27.6 percent white, but is 48.8 percent black. These schools are underfunded and understaffed. In 2001, the American Civil Liberties Union filed a lawsuit after 18 public schools had “literature classes without books,” computer classes where students discuss what they would do if they had computers, “classes without regular teachers” and classes without enough seats where students stood in the back. Mazumder finds that student scores on the Armed Forces Qualification Test (a comprehensive test taken toward the last few years of high school) can help explain differences in upward mobility between blacks and whites. He also finds that completing 16 years of education is a crucial factor in upward mobility. The fact that AFQT scores help predict upward mobility is often used by those who argue that racial differences in intelligence largely explain differences in upward mobility. However, since the AFQT is taken in high school, a better explanation is that differences in AFQT scores represent the combined impacts of poverty, bad schools, wealth gaps, substandard healthcare and segregated employment opportunities working together to reduce long-term mobility. This all leads to the saddest conclusion — were it not for poorly conceived policies, we could have more upward mobility in the U.S. While conservatives like to point at cultural factors and throw up their hands, a far more productive solution is to redress our massive public policy problems — like the war on drugs and dropout mill schools — that are proven to reduce upward mobility. This entry was posted in Economics, Politics, Race and tagged conservatives, education, Ferguson, household, incarceration, jobs, Poverty, race, Republicans, segregation, upward mobility, war on drugs on September 22, 2014 by seanadrianmc@gmail.com. In the wake of the Ferguson shooting, a recent Pew poll finds that 47 percent of whites believe that “race is getting more attention than it deserves,” with regards to the death of Michael Brown, while only 18 percent of African-Americans feel the same. Meanwhile, a similar Pew study found that whites are far less likely to see discrimination in the treatment blacks receive by the education system, the courts and hospitals. Such views are held by many Americans, who believe that “blacks are mostly responsible for their own condition.” Police killings of unarmed blacks are certainly the most visible manifestation of systemic racism, but data show that racism still manifests itself frequently in everyday life. In America, race determines not just where someone lives and what school he or she attends, it affects the very air we breathe. Although many whites wish to believe we live in a “post-racial” society, race appears not just in overt discrimination but in subtle structural factors. It’s impossible to delineate every way race affects us every day, but a cursory examination of major structural racial problems can give us a feeling for how far we still have to go. Researchers have increasingly referred to a rise of “apartheid schools,” which are almost entirely non-white. 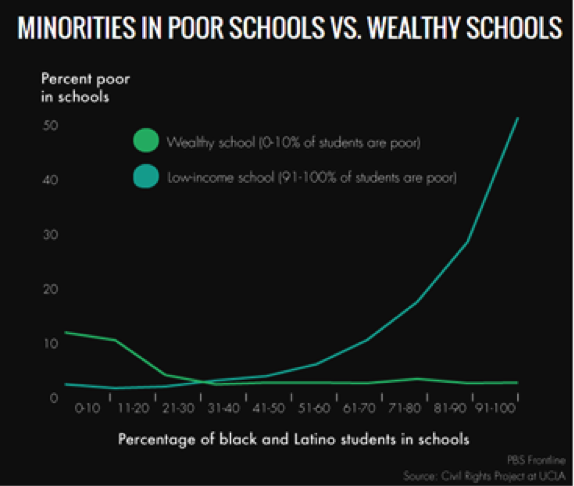 In 2003, one-sixth of all black students were educated in such “apartheid schools.” These districts are underfunded and understaffed, and frequently referred to as “dropout factories.” So students of color are far less likely than their white peers to attend schools with a full range of advanced courses. At the college level, the situation is little better. A recent report by Anthony Carnevale and Jeff Strohl finds that college education in America consists of “a dual system of racially separate and unequal institutions despite the growing access of minorities to the postsecondary system.” They find that students of color are less likely to end up in the most selective schools than white students with the same qualifications. The housing crash disproportionately affected blacks and Hispanics, who were more likely to receive subprime loans even when compared to whites with similar credit scores. In one instance reported by the New York Times, a loan officer at Wells Fargo said the bank “saw the black community as fertile ground for subprime mortgages, as working-class blacks were hungry to be a part of the nation’s home-owning mania.” However, even before the recession, disparities inemployment, college education, homeownership and inheritance helped solidify racial wealth gaps. Instead of wealth, more and more Americans, particularly people of color, are burdened with debt. A recent Pew Research Center study shows that not only do blacks have lower levels of upward mobility; among those that do make it into the middle class, their children are more likely to slide back into poverty. In what may be the most depressing footnote I’ve ever seen in a chart, Pew notes that there are not enough observations of blacks in the fourth and fifth (read: highest) quintiles of income to make observations about upward mobility. Surprisingly, Mazumber finds that “[w]hile these results are provocative, they stand in contrast to other epochs in which blacks have made steady progress in reducing racial differentials.” While we like to believe we are constantly progressing, these data suggest we may be backsliding with regard to mobility and race. The U.S. prison population grew by 700 percent between 1970 and 2005, while the general population grew only 44 percent. According to the Bureau of Justice statistics, around half of federal prisoners’ most serious offense is drug-related. The war on drugs has undermined the legitimacy of law enforcement and eroded their esteem in the eyes of the public. Even before the Ferguson shooting, 70 percent of blacks agreed that, “blacks in their community are treated less fairly than whites” when dealing with the police. This is to barely touch on the empirical literature on school punishment, access to healthcare, a history of racially biased federal policy and the other deep issues that we face. The most disturbing fact is that in almost all of these areas, we have actually seen previous progress eroded, even while we proclaim ourselves a post-racial society. It’s time to take an honest look at race in America. We probably won’t enjoy it. But we need it. This entry was posted in Economics, Politics, Race and tagged education, Ferguson, income, inequality, race, upward mobility, war on drugs, wealth on September 4, 2014 by seanadrianmc@gmail.com.